Maternity Photos: Just Do It! Some pregnant women shy away from the idea of having maternity photos done (like me). But, really, I say GO FOR IT and here's why. 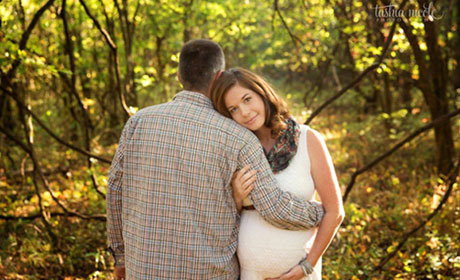 Have you ever thought about having maternity photos taken? I didn't with my first two children, but I wish I had. These days everywhere you turn someone has picked up photography and is doing sessions on the side — some are pretty darn good at it, too. My sisters decided to go in together and hire a photographer to do maternity photos for me. I was excited (and nervous) about the opportunity that was ahead ... I was grateful that the photographer had some nice ideas in mind for my shoot — and a dress ... you know, the one that is practically completely open in the front to show your belly! That, I thought, is NOT me. The day before the shoot, I tried on the open front dress and felt that it was hideous on me. I wasn't about to traipse around in it at a park for photos. But, then the day of ... I changed my mind. My sisters were in my corner cheering me on. So, I just went for it — with one exception. I wore shorts under the dress! Clutching the dress closed in front of me, I wore that dress and I wore it proudly! With my hair and makeup done, I felt like a princess standing in the golden sun. This was the first time I ever felt like the focus was solely on me — and that felt great! It's NOT all about the baby for once! Photographer, Tashia Landwehr of Tashia Nicole Photography, was kind and attentive. She encouraged me, saying sweet things to make me smile. It's that sort of kind attention that pregnant women long for with hormones all out of control. The photos turned out great and now I'll have a memento for years and years to come. So, if you're on the fence about getting maternity photos done, don't be. Just do it! You'll love the way it feels and you'll enjoy the end result. You don't have to share your photos with anyone, either. You can keep them as a memory keeper of your most momentous occasion — Baby on the way!